If you are in Matric, the importance of using past CBSE Sample Paper for Class 10 Math in preparing for your board exams cannot be overemphasized. By utilizing the previous year’s exam papers, students can discover what they do know or don’t know at all. By the same token, it also elucidates what you already know. What is more, it can also be utilized for SWAT analysis and to check your time management skills. Sample papers also help in familiarizing with examination terminology and technical jargons used in the actual exam. How to study CBSE Sample Paper for Class 10 Maths? For students who want to succeed, the Sample Question Paper of Class 10 CBSE Maths is available in free downloadable PDF form. You can find the sample papers originally published by the CBSE as well as the ones prepared by our examination experts with extensive research. These are prepared in reference to previous year question papers trends and latest math paper pattern. All the CBSE Class 10 Maths Sample Paper comes with answers. However, students are requested to practice sample papers within the specified time limit of 3 hours. You can look for the answers after attempting to solve the question paper on your own. It will help you discover your weak areas which require more hard work and you can also learn how to correct the answers by matching with the solutions. 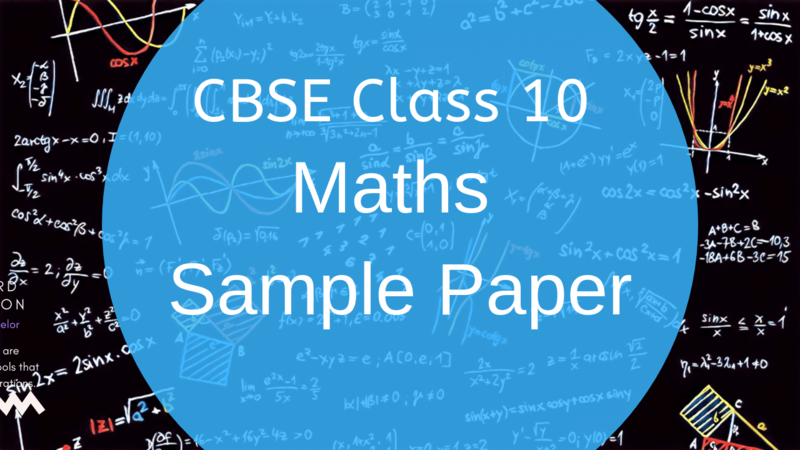 Studying Sample Question Paper of Class 10 CBSE Maths is an important part of exam preparation. It is a great way to do examination revision and stay focused on paper pattern whilst practising CBSE board-style questions. Past Sample Question Paper of Class 10 CBSE Maths can be the most useful tools available to prepare for both internal and external examinations. They provide students with practical insight into how the forthcoming final board exam paper. Therefore, before commencing the final exam revisions it is worth taking time to solve previous year sample question papers. Indicates the typical number of questions. Identifies the number of choices provided. Helps work out the time required for each question. The Doubtnut is India’s leading online learning destination for students of class 6th, 7th, 8th, 9th, 10th, 11th and 12th. With highest 4.4 Google Play Store rating ‘Doubtnut App’ offers downloadable/Sharable Maths Sample Paper for CBSE Class 10 with Solutions in self-explanatory video tutorials formats. If you have not used previous year’s sample papers before, then you get here authenticated and highly reliable Mathematics study materials for board examination preparation. Visit us at www.doubtnut.com or install ‘doubtnut’ App from Google Play Store! It is 100% FREE and Maths-based.